HELLTOWN BEER: 44% of MLS Season Gone, Too Early for Playoff Picture? 44% of MLS Season Gone, Too Early for Playoff Picture? A couple weeks from now will mark the halfway point in the MLS season so I decided to take a look at what the playoffs would look like. I regret this decision as I now have a headache. 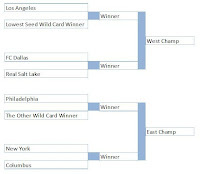 "Each conference has a Wild Card playoff game, which is single elimination. The league's 7th seed plays a 10th seed, and the 8th plays the 9th, with the winners playing the top-seeded team in the Conference Semifinals. The lowest-seeded survivor plays the Supporters' Shield winner." "Conference Semifinal series are conducted in a home-and-away, aggregate-goal format. The lower-seeded team in the Conference Semifinal hosts the first game. The winners of those four series advance to single-game Conference Championships that will determine the MLS Cup finalists." Where to start... one thing I don't quite get is how they know that the top three in each conference will make up the top 6 in the league on the combined table. As it stands, that's not the case. I get that it is a re-seed. But, ah, whatever. For the rest of this exercise we will need both league table formats (conf breakout and combined), pen and paper. Pay attention now. First; At the top of this post I have included the table that breaks the East and West out. Top 3 from each. Okay. Simple enough. Preston! put your pen down. I've included that on the hand out on your desk. Second; we need to get our Wild Card teams. For that, look on the right for the single table. On your paper and with your pen, eliminate the top 3 teams from each conference. Got that? Good. 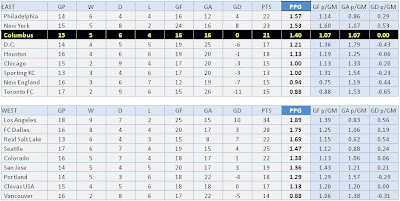 Now circle the next 4 teams with top highest in points. In this case, as it stands now, a 6th seed gets the call - Seattle. Not a 7th seed as the MLS states. The lowest seed winner of these two games will go on to play the Supporters' Shield Winner (team with most regular season points). 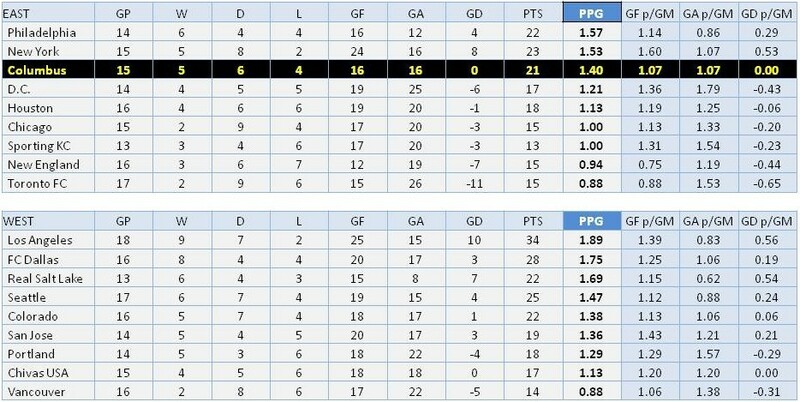 LA Galaxy, as it stands. The other winner will play the highest seed in the conference of which the Supporters Shield winner isn't. This case? Philadelphia. Goooo Union. You son's of Ben. Here, the picture gets a little more clear. Except that it's not really East and West Champion. Either Conference could have a team from the other win. This year it is likely to happen in the East Conference since 7 of the 10 teams would be from the west (as it stands now). WAIT. Are you serious? only 2 teams from the west wouldn't make it into the playoffs? There are so many things wrong with this playoff format already but let me throw another log on the fire. And douse it with gasoline. Record: West: 8 wins, 7 draws and 0 loses. Portland has benefited the most with 3 (of their 5) wins during this time slot. One draw (out of 3). 0 loses. In other words... 10 of their 18 points right now. You connect the dots. Philly, Toronto and New England have paid the largest sleepy time price with 3 games each out west that late. 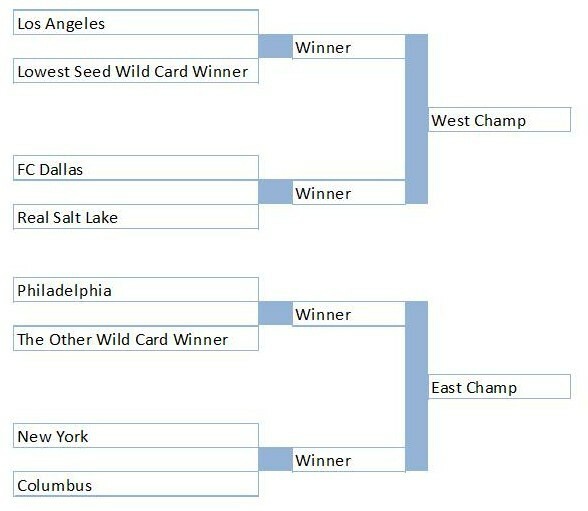 New York is the only team to have shown well out west, catching a couple draws. The MLS plays double round robin. Each team playing twice. This differs from other domestic leagues in that those teams play most games according to conference (i.e. in their time zone). Late games do happen on occasion in the MLB and NHL. But not as common. The NFL doesn't touch game start times after 10 PM EST. The MLS is still a young league. They are a decade away from the clock that counts down and stops during, uh, stoppage. Also far away from the extra GK sub and secondary assists. Oh, and the 35 yd game deciders with 5 second clocks. Christ. It's gotten a lot better. The playoff buzz will be exciting till the end of the regular season, especially for the west. I do like that they are involving the combined table to pick the wild card spots. But, ultimately, it is convoluted. Two tables to keep track of? Maybe they are easing us into the single table format. I dunno. I'm not against a playoff format in soccer. It's neat. The lower divisions in England have it (go Swansea! first Welsh team in the modern PL!). But when Major League Soccer expands to 20 teams it may make more sense to just make it the top 4 or 8 in each conference then have the top 2 play. And then... In Billy dreamland... after that - when each conference is expanded organically to 18 in each with 2 lowest getting relegated back down to the (combined) USL/NASL and the top from each conf going on to play each other? I'll be in soccer heaven. In the US. Dreamland. Where Crewnicorns frolic in a downtown stadium. Ahhhh. MLS has the key's to a Ferrari here. They just need to go start it. Hey! my headache is gone.